THE HEROESONLINE BLOG | HEROESCON 2014 :: THANK YOU! 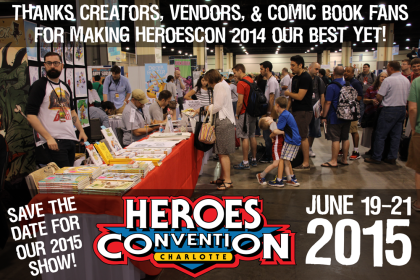 HEROESCON 2014 :: THANK YOU! Thanks to everyone that came out to HeroesCon 2014! We are once again thankful and humbled by the great things that happen we when our wonderful community of comic book makers and comic book loving people get together. You are all amazing! Save the dates for our 2015 show, June 19-21, 2015!